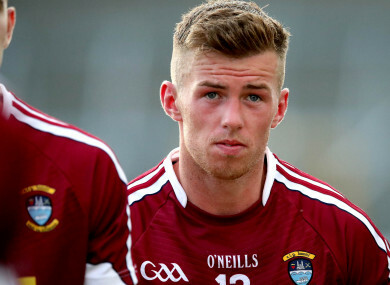 Westmeath's Ger Egan was once again impressive in his side's dramatic win over Offaly. JOHN MAUGHAN’S OFFALY reign began with an agonising defeat as their neighbours Westmeath made light of an eight-point deficit early in the second-half to seal a dramatic 0-13 to 0-12 victory in injury time. The O’Byrne Cup winners ultimately atoned for a a desperately sluggish start, and found themselves six points down by the time Ger Egan got them off the mark in the 25th minute. The half-time gap was four points, but was twice that within 10 minutes of the restart as Offaly flew out of the traps once more. Westmeath then began reeling in their neighbours once again, and a Tommy McDaniels point levelled the game with four minutes of regulation time to play. From there Westmeath stole the win: a 73rd-minute point by Kieran Martin and a subsequent missed ’45 from Offaly ‘keeper Paddy Dunican consigned Maughan to early anguish. The hosts made by far the better start, leading 1-6 to 0-3 at half-time. Any meagre hopes of a Sligo comeback diminished with the sending off of midfielder Darragh Cummins for an off-the-ball incident. With Carlow replicating last year’s rigid defensive structure and Paul Broderick largely unerring from placed balls, Sligo grew increasingly frustrated. In the same division, Longford dealt with the absence of their Mullinalaghta contingent with a hard-fought two-point win over Louth, with late points from Darragh Doherty and Nigel Rabbitte earning the midlanders a vital early win. Louth played the final 15 minutes with 13 players following the dismissal of midfielders Tommy Durnin and Conor Early, the latter for a combination of black and yellow cards. In Ulster, Derry started the process of remedying the self-inflicted indignity of finding themselves in Division Four with a one-point win away to Antrim. Shane McGuigan converted a penalty for Derry five minutes into the second-half, with a subsequent Paddy Coney point leaving the visitors four points ahead. Antrim, however, clung gamely on, and drew level in the first minute of injury time. From there Derry had a glorious chance to win it, only for Enda Lynn to miss a penalty earned by Coney. Still they snaffled victory, as Padraig Cassidy fisted a late point. Elsewhere, Terry Hyland made an eye-catching start to life with Leitrim with a 3-15 to 0-11 hammering of Wexford. The game was consistent with the tennis-style scoring that marked the half-time scores across the basement division, with Wexford leading 0-7 to 0-6 only for Leitrim to startle the visitors with a blizzard of scoring in the second-half. At the 37-minute mark they were level at seven points apiece; ten minutes later Leitrim led 3-9 to 0-8, with a Dean McGovern goal following a brace from Ryan O’Rourke. In the end, the winning margin was 13 points. Limerick, meanwhile, emerged one-point winners in their clash with London at Ruislip, winning 0-11 to 0-10. Email “Westmeath win with late drama against Maughan's Offaly as Derry nudge past Antrim ”. Feedback on “Westmeath win with late drama against Maughan's Offaly as Derry nudge past Antrim ”.